Spring has sprung around the village here in Maynooth, and, despite a day or two of snow too, we've been fairly lucky with the weather, especially for our live RTÉ broadcast from St. Patrick's Church in Strandhill, Co. Sligo of Mass for St. Patrick's Day. The Mass itself was a beautiful celebration of St. Patrick's Day, with trad. dancers, members of a local trad. group, the school choir, the parish choir, and members of local Faith and Light group Cuán Iósa all taking part in the Liturgy throughout the Mass. We were welcomed warmly by all in the village and the wider community; and it was a special Mass for our sibling duo Seamus and Ita as their grandparents ran a hotel in the village for many years while their parents were married in the Church over 50 years ago! It was also an interesting Mass from a technical point of view - we had the pleasure of working with Skylite Balloons on this broadcast, a unique lighting system based in the U.K. and N.I. who help utilise giant balloons which throw a lovely even light around the room. It was perfect for our small church in Strandhill and meant that we didn't need to have large lighting stands and cables taking up extra space around the pews or aisles. Aside from that, it's been a busy month production wise, with projects on the go from neighbours St. Patrick's College, special ads for Knock Shrine (who celebrate their 140th anniversary this year) being tweaked before their TV broadcasts, as well as editing another episode of KMF's production "What in the World" which is due to be broadcast on RTÉ soon. We were privileged to be asked to film the premiere of beautiful piece of music called Psalmus Invitatorius, which was composed by Martin O'Leary for the 50th anniversary of the Maynooth University Choral Society. It was performed by Maynooth Choral Society, Maynooth Chamber Choir and Schola Gregoriana Maynooth who were accompanied by the Irish Choral Sinfonia. It also featured Soprano Sylvia O'Brien, Alto Gina Oberoi, Tenor Andrew Gavin, Baritone Simon Morgan, and Bass singer Jeffrey Ledwidge, all directed by John O'Keeffe in the beautiful Gunn Chapel. It was an incredible afternoon of music, which more than made up for missing the Irish rugby match against the Italians that afternoon! Ger and Ita were also filming nearby recently, over in Dunboyne to film St. Peter's College production of "Sweeney Todd", which was incredible - from the sets to the singers/actors and musicians, if you didn't get a chance to see it live, I'm afraid you missed something special! Our Maynooth Uni. Media students have been busy both in and out of studio, creating new sets for their drama pieces and prepping for their talk show. The First Years have been out and about shooting interviews; whilst the Third Years are currently in the middle of shooting their short films, which are due to be aired in class early next month. We've also welcomed quite a few schools into our studio for our TYTV days, from as nearby as the school across the road (Maynooth PPS) to classes from Borrisokane and Moyne! 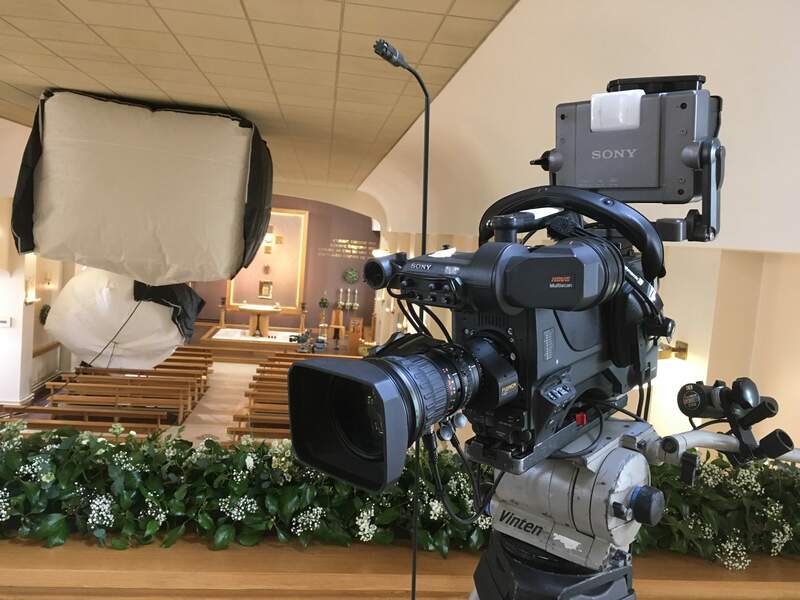 April promises to be a busy month, with our two Easter Liturgies, which will be RTÉ broadcasts; as well as several shoots and live-streaming jobs. Our most recent live-stream was across with Maynooth University for their graduation ceremonies on March 22nd, which was an important day for us here at Kairos as our cameraman, editor and all-around-production-man Seamus received his M.A.! Kairos Communications, Moyglare Road, Maynooth, Co. Kildare, Ireland.